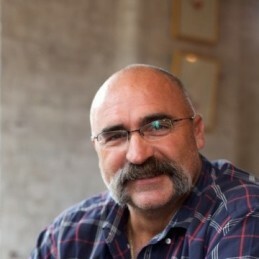 Merv Hughes is nothing short of being an Australian sporting legend and icon. A big-hearted fast-bowler and larrikin, he destroyed batting lineups the world over. Perhaps the most recognisable person in Australian sport during that era, Merv played at the highest level between 1985 and 1994. He gave every effort, left nothing on the park and helped the Australian team back to glory. Merv was born in Euroa, Victoria. His school teachers described his hunger for sport as unquenchable. His enthusiasm for sport led him to professional cricket. Beginning with Footscray-Edgewater in 1978/79, the club later named their main home ground, the Mervyn G. Hughes Oval, in his honour. Merv was selected to play for Victoria in 1981-82 and Australia in 1985-86. His international career would see him play 53 Test matches, taking 212 wickets, and 33 One-Day Internationals, taking 38 wickets. One of Merv’s career highlights was his hat trick against the West Indies at the WACA in 1988-89. He would take a total of 8-87 in that match. Merv saved his best for the 1993 Ashes tour of England. During the six Tests Merv took 31 wickets from almost 300 overs, taking Australian to a 4-1 series win. A serious knee injury that he suffered in the 1993 tour limited Merv and, although he would come back the following summer, he wasn’t able to recapture the same glory at the international level. Merv would later play for the Canberra Comets during their time in the domestic one-day competition and later returned to his local club Footscray. Merv was a more than useful lower-order batsman. He hit two half centuries and made over 1000 career runs. Merv spent time as an administrator with Cricket Australia between 2005 and 2010, replacing Allan Border as an Australian selector. Merv was almost unrecognisable in a suit and glasses. In 2006, Merv’s passion for fishing would inspire him to write his first book ‘Caught in the Deep’. Merv is the first to admit that he is far from an expert angler but he firmly believes that you don’t have to be a pro to enjoy fishing, all you need is a love of the outdoors, a willingness to learn and a sense of adventure. Merv is involved in partnerships with Diadora, Australian Sports Tours, Grunt and Unibet. As one of Australia’s most beloved larrikins, Merv is an incredibly popular keynote, anecdotal and/or motivational speaker.